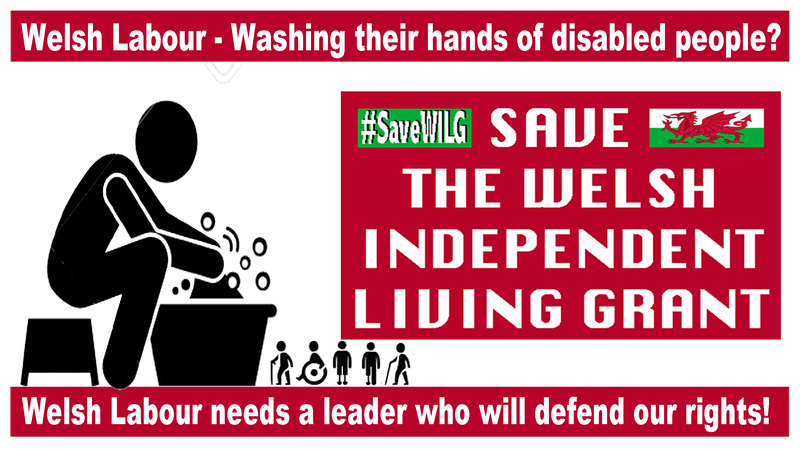 A disabled activist who has campaigned to save the Welsh Independent Living Grant (WILG) is celebrating after the Welsh Labour annual conference voted to back his campaign. Nathan Lee Davies has led a campaign to force the Labour-run Welsh government to reverse its decision to scrap the grant, which was introduced to support disabled people with high support needs in Wales to live independently after the UK government closed the Independent Living Fund in 2015. An estimated 1,300 people in Wales receive support through the WILG scheme. And this week, at their annual conference, members of Welsh Labour voted in favour of a motion that called on their government to maintain WILG, at least until the next Welsh assembly elections in 2021. Before the vote, Davies had also secured support from Labour’s UK leader, Jeremy Corbyn, who posed for a picture holding one of the campaign’s “WHERE THERE’S A W.I.L.G. THERE’S A WAY” tee-shirts. After the vote, Davies posted a blog in which he described his “emotional day” following a victory he said was “key for disabled rights across Wales and throughout the UK”. Davies has previously described his terror at the prospect of his cash-strapped local authority taking over full responsibility for providing his care package, having been told that without WILG his own care package would be reduced from 86.5 hours to just 31 hours a week. He has described the campaign as a “life or death” fight. He told Disability News Service yesterday (Wednesday) that the passing of the motion was “obviously the high point of our ever-growing campaign” but that it “does not mean that we have succeeded in securing WILG”. He said: “We must continue with our campaign and ensure the Welsh government listen and act upon the wishes of their members. He thanked the cross-party and union support for his campaign – including the “wonderfully supportive” Clwyd constituency Labour party, which proposed the motion – and the other recipients of WILG. He particularly praised members of Welsh Labour Grassroots – which represents the Momentum movement in Wales – who he said had “worked tirelessly to ensure independent living remains an option for those with high care and support needs”. Davies is hoping that the Welsh government – which will have a new first minister in the autumn after Carwyn Jones announced that he would be standing down – will now reverse its decision to scrap WILG. The Welsh government announced in 2016 that, after a two-year transition period, it would transfer all the £27 million-a-year provided by the UK government to support former ILF-users in Wales directly to councils. It decided there would be no continuation of the interim WILG scheme it had been running as a stopgap since the Department for Work and Pensions closed ILF in June 2015, and would not set up a new Welsh ILF, even though such a scheme had been set up in Scotland. All the £27 million-a-year funding is set to be transferred to Welsh local authorities this year, and they will be solely responsible for meeting the support needs of all former ILF-recipients by 31 March 2019. The Welsh government’s new Social Services and Wellbeing Act is supposed to provide new rights for people to access a re-assessment of their support at any time, with local authorities under new legal duties to support independent living. It believes that this is a more progressive system than the one operating in England. But Davies has said previously that the decision to transfer the £27 million to councils and close WILG meant the Welsh government had “sold disabled people down the river” and was “washing their hands of all responsibility for social care to former ILF recipients and transferring the pressure onto local authorities”. THIS ARTICLE ORIGINALLY APPEARED ON THE DISABILITY NEWS SERVICE WEBSITE AND WAS WRITTEN BY JOHN PRING. A disabled activist has handed in a petition of hundreds of signatures that calls on the Welsh government to reverse its decision to close its version of the Independent Living Fund (ILF). Nathan Lee Davies (pictured) says he is fighting the decision to scrap the Welsh Independent Living Grant (WILG) because he is terrified of the prospect of his cash-strapped local authority taking over full responsibility for providing his care package. He has been told that without WILG his own care package would be reduced from 86.5 hours to just 31 hours a week. He says that such a cut would put an end to all his current community activities, including his involvement with Wrexham Glyndwr University, Wrexham football club, Disabled People Against Cuts, FDF Centre for Independent Living, and the Care and Social Services Inspectorate Wales. He is also writing two books, and a blog, and is working with Disability Arts Cymru to create a performance and exhibition of his poetry. He told Disability News Service (DNS): “I cannot cope with such a limited number of hours per week. This is why I am fighting with every fibre of my being. “It really is a case of life or death. I have no interests in merely existing. I want to live. The Labour-run Welsh government announced last November that, after a two-year transition period, it would transfer all of the £27 million-a-year provided by the UK government to support former ILF-users in Wales directly to councils. There will be no new Welsh ILF – even though such a scheme has been set up in Scotland – and no continuation of the interim WILG scheme the Welsh government has been running as a stopgap to “ensure continuity of payments to recipients” since the Department for Work and Pensions closed ILF in June 2015. Funding for WILG will now transfer to local authorities during 2018-19, with all former ILF-recipients in Wales having their support needs met solely by their local authority by 31 March 2019. Since the Welsh government’s announcement, Davies has been campaigning to persuade it to reverse the decision, including setting up the petition – which has now been signed by more than 500 people online and in person – and collecting photographs of supporters holding one of his campaign postcards. He said: “The current system allows users the security of depending on receiving their funding from three different ‘pots’ – WILG, local authorities and our own personal contribution. “This gives us a sense of security and ensures that we cannot be dictated to as mere passive recipients. “Instead, all parties have to be in agreement about what will benefit the individual the most. But instead of this three-tier system, he said, the Welsh government had now “sold disabled people down the river. But Disability Wales, which was part of the stakeholder advisory group the Welsh government consulted, has made it clear to DNS that it did not support passing funding to local authorities. Davies said he believed the Welsh government had listened only to the local authorities on the advisory group. He has been supported by the north-east branch of the Labour left-wing grassroots campaign Momentum and the Unite union in Wales. But he said he was disappointed that Disability Wales – the national association of disabled people’s organisations in Wales – had not supported his campaign. Miranda Evans, policy and programmes manager for Disability Wales (DW), said they were not able to support the petition – which is critical of the Labour party in Wales – because it was too party political. But she stressed that DW’s preferred option was for a new Welsh independent living scheme – a Welsh version of ILF – that would protect those currently receiving WILG funding and would also be open to new members. DNS has seen DW’s response to an early consultation on the Welsh government’s plans, and it makes it clear that none of DW’s members or the other disabled people it had consulted about the future of WILG were in favour of handing the funding directly to local authorities, and had instead “expressed strong opposition” to this. It also stressed that such an option was “totally unacceptable to existing ILF recipients, their carers and other disabled people”. Disabled members of the Conservative party have launched their own investigation into the closure of the Independent Living Fund (ILF), following widespread concerns about its impact across the country. The Conservative Disability Group (CDG) has issued an appeal to former ILF-users and those who had friends or relatives who were recipients of ILF funding to help with the research. Disabled campaigners have accused the government of trying to “wash its hands of all responsibility” for meeting the social care support needs of former ILF-recipients, with the transition process hit by reports of cuts to their care packages. ILF was funded by the Department for Work and Pensions, and when it closed on 30 June 2015 it was helping nearly 17,000 disabled people with the highest support needs to live independently. But ministers decided it should be scrapped, promising instead that nine months’ worth of non-ring-fenced funding would be transferred through DCLG to councils in England, and to devolved governments in Wales and Scotland. CDG – which provides a forum for party members with an interest in disability to raise concerns and make suggestions that can be passed on to Tory MPs and councillors – plans to write a report to share with the minister for disabled people, Justin Tomlinson. Wayne Henderson, a member of the CDG executive, has told members the project will examine how well the transition has been managed. He has asked for evidence of how the process has worked in different parts of the country, whether there have been any problems, and whether people’s care packages have been protected by their local councils. He told Disability News Service that it was CDG’s “first call for evidence in recent years” and that they were “using our limited resources to investigate one of the most current areas where there are reported problems in order to find out the facts”. But he said it was too early to say if he or other CDG members were concerned about how the transition from ILF closure had been managed. A spokeswoman for Inclusion London welcomed CDG’s decision to carry out the investigation, but said it was a surprise. In October, figures obtained by Inclusion London through a freedom of information request showed that in one local authority, Waltham Forest, more than a quarter of disabled people who previously received ILF support had had their social care packages cut by at least half since it closed. Meanwhile, the Department for Communities and Local Government (DCLG) has finally confirmed – following weeks of requests for information from Disability News Service (DNS) – that it will provide some funding to councils to compensate them for the extra costs of providing support to former ILF-users in 2016-17. DCLG had insisted that any grants to support councils with the costs of former ILF-users in 2016-17 would depend on the outcome of the government’s spending review, and later said it would provide details once last month’s local government finance settlement had been announced. A DCLG spokeswoman has now finally told DNS: “Local councils are now responsible for meeting all of the eligible needs of former Independent Living Fund recipients. “The government is committed to ensuring councils meet their duties under the Care Act 2014 to former fund recipients. Ellen Clifford, a member of the national steering group of Disabled People Against Cuts (DPAC), said: “I would be surprised – although delighted – if there really was continuation of the separate ILF grant determination. This week, DPAC issued an appeal for donations to set up a fighting fund to help former ILF-recipients challenge cuts to their care packages. Clifford said that cuts to the extent of those seen in Waltham Forest “mean robbing disabled people of independence, dignity and equality”. Changes to legal aid mean some former ILF-users are no longer eligible for help with their legal bills, but cannot afford to fund court action to challenge cuts to their care packages. Clifford said: “Legal challenges are an important way of testing out the rights of former ILF recipients under the Care Act 2014 and making examples out of local authorities that are not meeting their legal duties. Meanwhile, the Welsh government has confirmed, in an email to a former ILF-user, that it has allocated £27 million for 2016-17 to a fund it set up as a result of ILF’s closure. The Welsh independent living grant (WILG) funding will ensure that former ILF-users continue to receive their existing level of financial support for social care until at least March 2017. In the email sent to campaigner and former ILF-user Nathan Lee Davies, the first minister of Wales, Carwyn Jones, said the Welsh Labour government’s draft budget for 2016-17 “contains £27 million to enable the WILG to continue to March 2017 as planned”. He added: “I understand that the minister for health and social services will shortly be engaging with representatives of stakeholders to identify the best way of providing support in future. Davies said on his blog that this response was “the best Christmas gift I could have asked for as now I have it in writing that WILG will continue to March 2017 as planned”. A Welsh government spokesman said: “The UK government’s decision to close the ILF caused anxiety among those who receive support, and their carers. “The Welsh grant scheme to replace the ILF came into operation on 1 July 2015. It allows local authorities to pay existing recipients their current level of funding. The Scottish government has set up its own Independent Living Fund, for both existing and new users in Scotland. The Government has responded to the petition you signed – “Assess full impact of all cuts to support & social care for disabled people”. The Government is committed to a fair tax and welfare system. Every individual policy change is carefully considered, including looking at the effect on disabled people in line with legal obligations. The Government is committed to a fair tax and welfare system where everyone contributes to reducing the deficit, and where those with the most contribute the most. Every individual policy change is carefully considered, including looking at the effect on disabled people in line with legal obligations. However, it is not possible, using the Government’s existing analytical tools, to produce a cumulative assessment of the impact of policies on disabled people. HM Treasury has a world-leading distributional model, which it has used since 2010 to publish analysis of the impacts of policy decisions on households across the income distribution. This model uses the Living Cost and Food Survey (LCF), which does not have information on disability status. It contains expenditure information which allows analysis of the impacts of indirect taxes such as VAT and fuel duty, and underpins a unique model of public service usage; both of these enable HMT to consider the impacts of all of the Government tax and spending decisions which directly affect households. This analysis shows that the proportion of welfare and public service spending which benefits poorer households has not changed since 2010-11, with half of all spending on welfare and public services still going to the poorest 40% of households in 2017-18. At the same time, the richest fifth of households will pay a greater proportion of taxes than in 2010-11 as a result of government policy – and more than all other households put together. • Households which include a member who is in receipt of Disability Living Allowance, Personal Independence Payment, the Support Component of Employment and Support Allowance or UC equivalents are exempt from the benefit cap. Sickness Absence in the workplace is also a major issue, with employees off sick for four weeks or more being at greater risk of not returning to work. The Government recognises the importance of early support which is why Fit for Work has been developed; giving access to free, impartial work-related health advice to help employees on sick leave get back to work. In terms of Social Care and NHS reforms, the Government is committed to supporting the most vulnerable. The Care Act 2014 introduces a modern system to promote and maintain the wellbeing of those with care and support needs so they can live independently. This includes introduction of a new national eligibility threshold which allows local authorities to maintain previous levels of access for service users. This threshold is set out in Eligibility Regulations, and local authorities cannot tighten eligibility beyond this threshold. The Act also provides new legislative focus on personalisation by placing personal budgets into law for the first time for people and carers, increasing opportunities for greater choice and control, so that people can choose social care best suited to meet their needs.